A 30 yo female with 2weeks history of headache. CT study of brain show hyperdensity in the region of right transverse sigmoid sinus – a subtle finding. No other parenchymal abnormality. It’s better to advise MR in such case or if available you yourself run needed MRI Brain sequences and Venogram to rule out CVT. At the most u may need an axial FLAIR and a noncontrast 2D TOF MR Venogram. In this case there is loss of normal T2 flow void in the region of right transverse sigmoid sinus and superior sagittal sinus with an isointense soft tissue signal intensity material occupying the sinus. 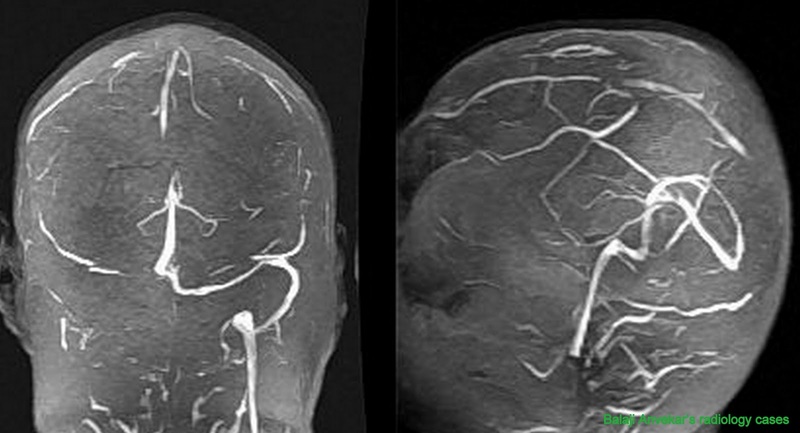 Right transverse sigmoid sinus not visualised on MR Venogram with poor flow related signals in the region of major portion of superior sagittal sinus implies to thrombosis. 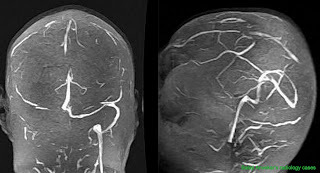 Sometimes despite of very obvious hyper density in the region of dural venous sinuses, surprisingly, the MR Brain and Venogam may turn out normal. The possible explanation for this are either 1. Increased blood density due to dehydration, physiological polycythemia or 2. Dominant sinus due to hypoplastic contralateral lateral sinus.